Now YOU can create BOLD, brightly colored, attention-grabbing signs, posters, or displays for any purpose! 10 artist-grade quality markers that will bring your artwork (and your child's) to life! The unique 6mm reversible tips are a must for any serious crafter: The round tip end creates bold strokes, and the chisel tip end generates sharp patterns and adds shapes to your art. Each Neon Liquid Chalk Marker is filled with 8 grams of ink - double the amount in most other markers. We import our marker tips from Japan to ensure you get the best chalk tips available - tips that retain their shape even after many hours of use. Research suggests the process of creating art improves cognition and increases attention span. These eco-friendly liquid chalk markers will provide hours of stimulating, brain-enhancing activities for all ages. 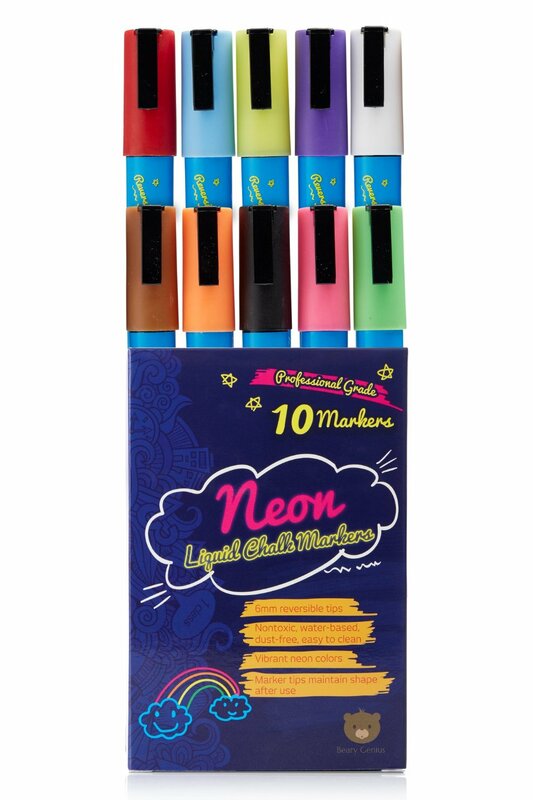 Neither you nor your child will be able to resist creating eye-catching pictures with your new Neon Liquid Chalk Markers, all of which conform to American and European safe art supplies standards. These markers have multiple uses limited only by your imagination, and make an excellent gift for both children and serious crafters. Use Beary Genius Neon Liquid Chalk Markers on nonporous surfaces such as glass, tile, and dry-erase boards, and they'll wipe clean without a trace. Beary Genius Premium Artist-Quality Neon Liquid Chalk Markers have so many uses! As a homeschooling mom, I'm always looking for new ways to get my kids excited about learning. One way I recently did this was to teach a lesson on my daughters bedroom window. She thought it was so neat and asked if she could decorate her window afterwards. I have to say these are so fun to use! Both my daughter and I had a blast using them. They wipe of completely clean and look fabulous on a white board, chalk board, mirror, window and so on. There's so many uses for these! Follow Beary Genius on social media!